In this easy Arduino UNO tutorial, we are going to use a simple Piezo Transducer to create some beeps. Piezo Transducers are similar to speakers in that an applied voltage causes the piezo crystal to move and make a sound. In order to get a tone a square wave needs to be applied usually in the range 20Hz to 20kHz. We will use the PWM functionality of the Arduino to create a tone on the piezo transducer. The Arduino PWM runs at 500Hz so will produce a nice audible tone. 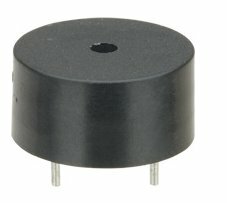 We use the Piezo Transducer available here. In the Arduino Sketch shown below we have created a separate function beep() which sends the PWM signal to the transducer, waits for a small delay, then turns the transducer off, then has another small delay. Thus, it beeps once. The delay (in milliseconds) is passed as a parameter. The PWM pulse duration (20 in sketch below) should not be important as it is the frequency that matters; set it to somewhere in the middle of the PWM range. The sketch below beeps 3 times at startup and then beeps continuously at a slower rate.